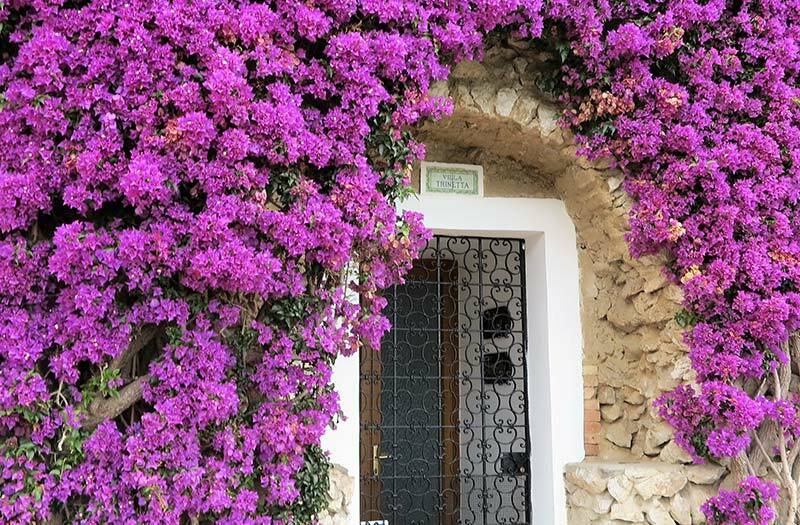 Magical – when it takes one word to describe the Aeolian Islands walking tour in Sicily, this is it. The ever-changing colors of the sea, the pure white houses set amidst vibrant gardens, the trail to a smoking volcano, and the intense flavors of the islands’ cuisine all add up to a magical experience. 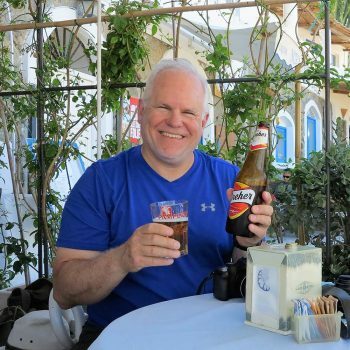 We’ll be based on the beuatiful island of Salina in a welcoming family-run inn with an excellent restaurant, pool, and a garden of lush lemon trees. 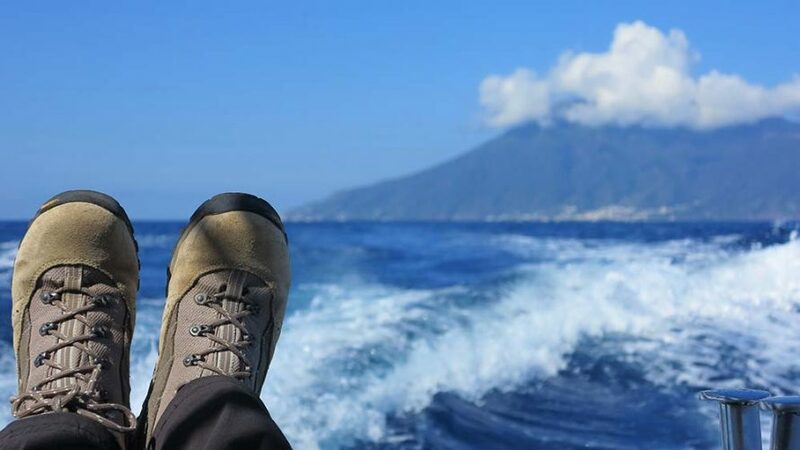 Each day we’ll ferry to a different one of the Aeolian islands and take a guided walk along ancient mule tracks enjoying the best views in the Aeolian islands and immersing ourselves in the unique beauty of each island. 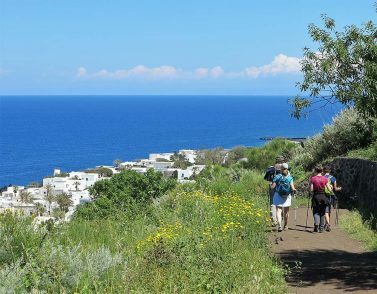 From the black lava beach and live volcano of Stromboli, to the lush green hills of Salina, and on to the faraway paradise of Filicudi, our walking tour of the Aeolian islands encompasses the best walks and fresh vibrant food of this magical archipelago, and will leave you longing to return. 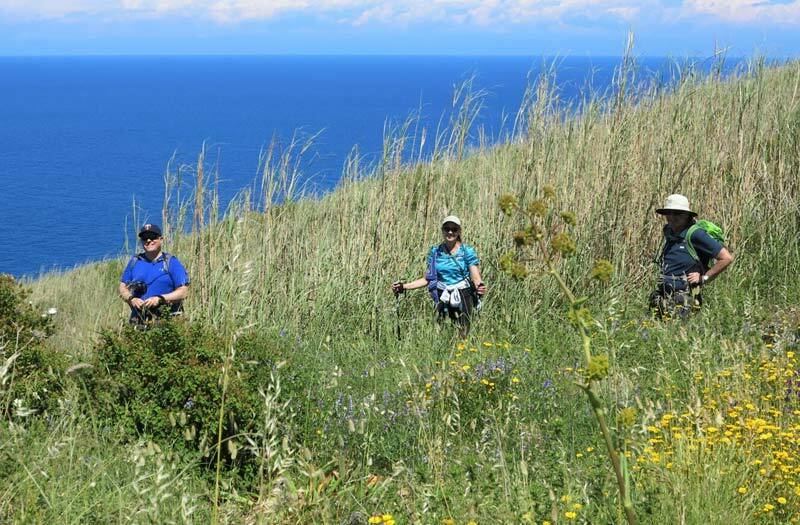 Meet at our hotel in Milazzo (direct connections from Catania airport in Sicily), ready to walk and explore the stunning and diverse Aeolian islands. The seven islands each have their own personality, from dark Vulcano, with its smoking volcanic gasses and sulfurous mud, to green lush Salina with sweet Malvasia grape vines thriving next to a tangle of capers and bougainvilla. 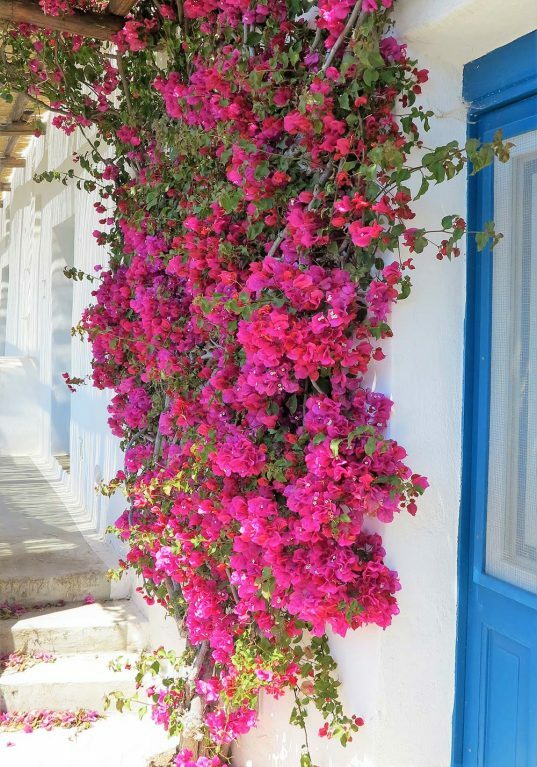 Whitewashed houses gleam in the sunlight of cool Panarea, while pastel pink houses dot the bustling island of Lipari. In tiny Alicudi and Filicudi, you step away from today’s world into a place where time moves in a leisurely rhythm, like the colorful little boats that rock in the tiny port. Let’s not forget fiery volcanic Stròmboli, spewing its red fireworks into the night sky. Our goals is to savor the essence of each island on foot, along with its cuisine and welcoming islanders, while never being far from the impossibly beautiful sea. Boat to the lovely island of Panarea, where whitewashed houses gleam with accents of bright blue. There are no cars here, just golf carts on the few roads, and a beautiful trail that overlooks the sea (3 hrs.) After a refreshing lemon granita, we return to Salina by boat. Dinner with fresh fish and a salad with cucunci, the locally preserved caper fruits. This morning we’ll take a break from the trail and visit one of Salina’s cantine, where the ambrosial dessert wine Malvasia is produced. Stop off at the Museum of Emigration, that details the history of the islanders and their lives abroad. After a typical lunch of pane cunzato, toasted bread topped with local tomatoes and capers, along with a sprinkle of salted ricotta and a drizzle of olive oil, we set off on our boat. 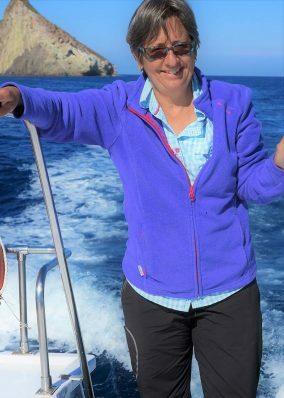 Our destination is the island of Stromboli, a dramatically stark c volcano jutting up from the sea, where we walk (3-4 hrs) to the sciara del fuoco – the path of fire – to observe the current volcanic activity. Convivial return to town past whitewashed houses perched above the black lava beach, and back to our boat. 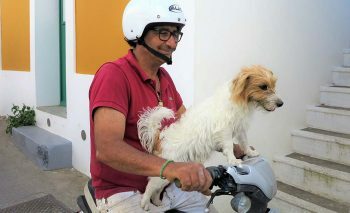 After a leisurely breakfast, we set off for the smallest of the Aeolian islands, taking a 3 hr. 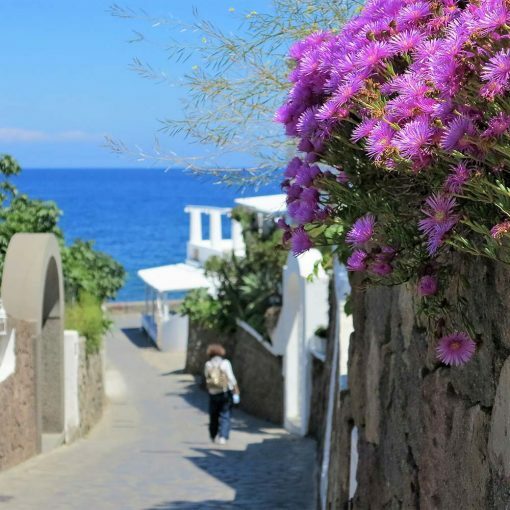 walk on Filicudi, and enjoying a lunch on a hilltop perch with fabulous sea views. Drift past Alicudi, with possibly time to swim in a lovely cove with delightfully clear water. This evening you may choose pasta con le sarde, a pasta dish made with fresh sardines and wild fennel, or choose one of the specialties made with salted capers grown on the island. Today we focus on the lush mountain of Salina, an extinct volcano, where leafy ferns flourish on the hillside. 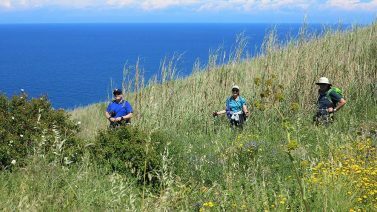 Walk from a Baroque monastery up to the island’s high point at Fossa delle Felci, an invigorating 5 hr. roundtrip. 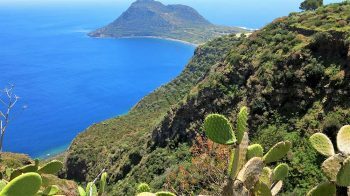 The views are breathtaking (gasp) when we finally reach the top, and it is possible to view the rest of the Aeolian islands from our dazzling viewpoint. We boat to the mysterious island of Vulcano, and walk to the Aeolian Islands crater of the volcano in an eerie moon-like landscape. (2-3 hrs.) In the afternoon, option to take a dunk in the sulphur mud bath that is said to cure nearly all ailments, before sailing past the island of Lipari. This evening celebrate our time on these magical islands at a lovely restaurant overlooking the port of Salina. Say goodbye to the Aeolian Islands as we ferry back to Milazzo, and begin our journey southwards through Sicily. 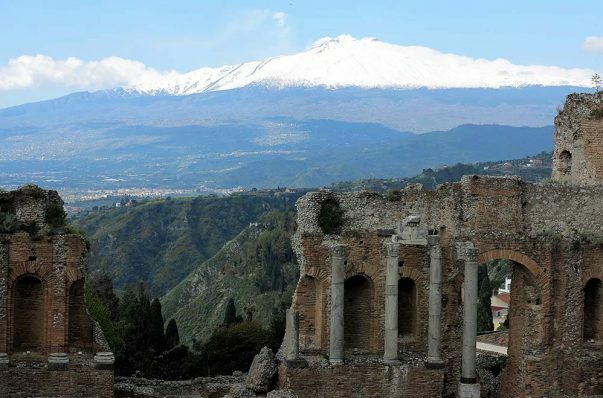 Visit the town of Taormina with its spectacularly situated Greek theatre, where the smoking Mt. Etna volcano is the backdrop – a scene fit for the Greek gods. After free time to explore the town, we continue to Catania for 1 night in a 4-star hotel in the center of the city. Join the lively passeggiata to our final festive dinner. Individual taxi transfers to Catania airport. Arrivederci! 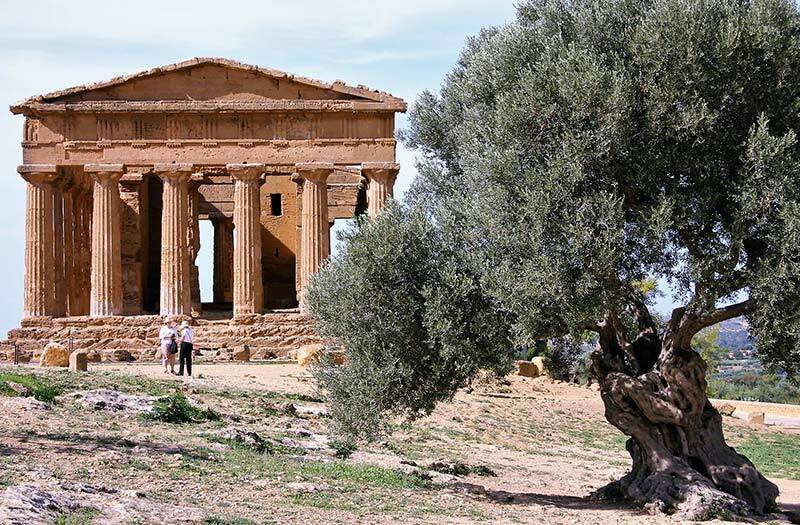 Note: The Aeolian islands were named for Aeolus, the Greek god of wind, and sometimes wind can tamper with our planned walks, making for a flexible itinerary. We send our wishes off to Aeolus and hope he sends calm seas our way. Otherwise, the daily itinerary may be altered according to the tour leader’s judgement.